Review of BBC Gardeners' World Live 2013,our plant of the month; Allium cristophii, perfect pairing (2 plants that go well together); Hemerocallis ‘Golden Chimes’ and Delphinium ‘Centurian Gentian Blue’ F1 and jobs to do in the garden this month. File Size: 15.4 MB, Duration: 33' 29"
BBC Gardeners World Live Show - 01' 18"
This year the show celebrated its 21st birthday. We discuss the UK's largest show of Bonsai trees, the show gardens and a trend in some of the gardens to use Yew (Taxus bacatta) as hedging instead of Box (Buxus sempervirens). Photos of some of this year's show gardens can be found on our Facebook page. You can also read more about this year's Gardeners World Live show in our show review. 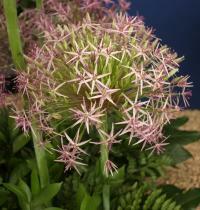 Plant of the Month - 07' 26"
Out plant of the month for July is Allium cristophii, also known as the Star of Persia. This ornamental onion is naturally occurring, growing up to 60cm tall with heads of 20cm diameter. They are hardy, need full sun and good drainage to prevent rotting (especially in winter) and make excellent cut flowers. Perfect Pairing - 10' 40"
For the month of July we've picked two plants that compliment each other: Hemerocallis 'Golden Chimes' and Delphinium 'Centurion Gentian Blue F1'. These plants have been picked for their complimentary colours of golden yellow for the Hemerocallis and azure blue for the Delphinium. These two colours are opposite to each other on a colour wheel. Both plants need full sun, fertile moist soil and are hardy perennials. Plants of Note - 20' 54"